Terre Haute, Ind. - An airbag explosion and building items for an upcoming Habitat for Humanity project were among the activities at the third annual Girl Scout Day, hosted by members of Females in Technology (FiT) at the Indiana State University College of Technology. Troops from Indianapolis, Greenwood, Carmel, Plainfield, Noblesville and Sheridan attended the event, designed for females from grades 6-12. Workshops offered to the troops included automotive, aviation, construction, mechanical engineering and packaging, and robotics. The sessions, approximately 30 minutes long, allowed each girl the chance to explore the many aspects of technology - from investigating vehicle safety, creating ideas for a new aircraft, to learning about blueprints, technical drawings and CAD software. Amanda Dunn, a Girl Scout from Greenwood, found the CAD session appealing. "It was pretty awesome," she said. "I'd like to learn more about it." Dunn's future career plans include interior design or teaching. Each workshop provided a hands-on activity to show the girls something that they might experience as a technology major. Under the watchful eyes of members of FiT and College of Technology faculty, girls participating in the CAD and construction workshops could witness the completion of a project from beginning to end, said Bev Bitzegaio, outreach coordinator for the College of Technology. "In the CAD session, the girls completed a two dimensional three-view drawing of a piece of furniture they would build in the construction workshop," she said. When the girls arrived to the construction session it was time to pick up the power tools and build a coat rack, step stool, ladder shelves and side table. "As part of the service component of the interest project, those items will be donated to Habitat for Humanity's Women Build Project," Bitzegaio said. "It's gratifying that we can contribute to a family's success while teaching students about technology." Each workshop was designed to provide the 25 girls with more information about technology majors and allow them to discover that there are abundant opportunities for females in technical career fields. FiT members not only offered the girls more information on their majors but also gave them a female perspective of being in a field that is predominantly male. "We hope the program will stimulate interest in science, technology, engineering and math as well as educate the girls about the wide range of career opportunities available for them in these fields in their futures," said Jennifer Hale, senior construction management major from Terre Haute and the president of FiT. The experience was not only a learning opportunity, but an eye-opener, according to troop leader Lori Wickstrom from Carmel. "It opened their eyes a bit," she said. "They learned a lot of interesting things." "What really hit home was the FiT members saying that they were at times the only girl in their class. Girl Scout Day showed the girls that women are entering technology," Wickstrom added. 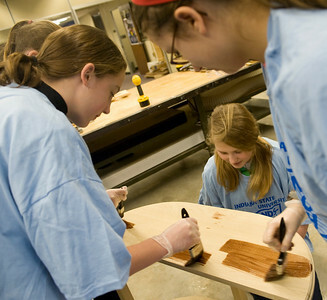 Participating Girl Scouts earned credit for the interest project, Build a Better Future. The ISU group is in the process of developing a FiT for the Future interest project badge for next year. "Girl Scouts Day will be modeled around the 'Build a Better Future' interest project," said Sarah Rodie, a senior mechanical engineering technology major from West Terre Haute and event coordinator for FiT. "The girls will still complete activities through interactive hands-on projects relative to our majors within the College of Technology that will be facilitated by our students and faculty. The neat thing is that this badge will be unique to ISU, and the Girl Scouts will only be able to earn it by visiting and exploring with us," she added. FiT hosts a conference every fall, and Girl Scouts Day every spring in addition to visiting K-12 schools, participating in career fairs and maintaining contact with girls interested in technology careers. For more information on FiT, contact Bev Bitzegaio at 812-237-3575 or bitz@indstate.edu. An airbag explosion and building items for an upcoming Habitat for Humanity project were among the activities at the third annual Girl Scout Day, hosted by members of Females in Technology (FiT) at the Indiana State University College of Technology.